One of my favorite quotes about kindness is by Julian Bowers Brown: “Kindness. Easy to do. Easy not to do. Choose the latter, no one will notice. Choose the former and lives may change.” How simple and yet how profound that statement is! How often do we have an impulse to extend a kindness—a word, a deed, a compliment, a brief note of appreciation—and then let it fall away? We think it’s too small, it doesn’t matter, I don’t have time…. The impulse dies unexpressed and we never know what difference we might have made in another person’s life. 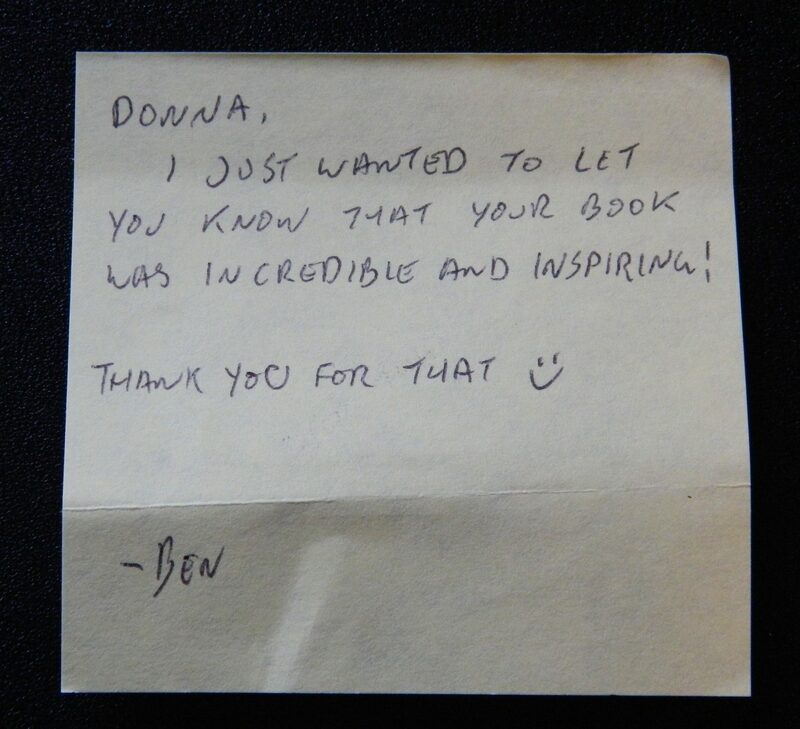 I’m keeping Ben’s note as a reminder—not just that he liked my book (which is wonderful and thrilling! ), but that what may seem to me to be a small or insignificant act—so small that it wouldn’t be missed—might turn out to be just what the recipient needs in that moment. I resolve to express more kindnesses and try to withhold judgment about their worthiness. How about you? Is there a yellow sticky note (or equivalent gesture) you could give someone today? Don’t put it off. Do it right now. You just might make their day . . . and that . . . could change the world. This entry was posted in Civility, Generosity, Gratitude, Kindness and tagged acts of kindness, empathy, Extending Kindness, Grace, Kindness, Micro-Kindness by Donna Cameron. Bookmark the permalink. This was the perfect post for me to read this morning! Like you, I was feeling down and helpless about what is going on in our country. Your post made me realize that there ARE things I can do to make a difference. They may seem like small things and if I don’t do them, no one will notice. But if I do make the effort and act on my impulse, what a positive difference I can make. Thank you. Thanks, Janis! The problems of the world just feel so huge (“yuge”) and I feel so small and powerless to impact them, but maybe if enough of us express those little kindnesses they will tip a scale somewhere. Gotta believe it! Great post and thought! I need to make people aware of how much they mean to me! And it can be so easy to do! Thanks! Such a simple thing. We can all learn a little something from Ben’s note. I had seen your quote at the top on a calendar before, but only the first sentence of it. It has become one of my favorite quotes, and I just want to thank you for sharing the rest of that quote! My pleasure! So glad it resonated with you. I agree! Sometimes the smallest gesture can make a huge impact. Which is why we should be as kind to each other as possible! If only we could remember that more often, Ann! Thank you so much for sharing this story. I feel your discouragement at the state of things. I’m inspired by you and your exuberance, Cathy! Thanks for your kind words and your thoughtful comment. I have seen that 5 to 1 ratio study and it’s powerful. Workplaces where positive comments outnumber negative ones by 5:1 are more successful, more profitable, and have far higher employee retention rates. What a difference it would make in the world if we all committed to 5 positive comments for every negative one we say. It would either be a much more positive world or a much quieter one–either way, a great improvement! Hoping your day is filled with kindnesses! Donna, I get to feel hopeful, connected and touched every time I read the quote you sent me after you participated in my “Leader as Influencer: Impression management in the spotlight” program. (Needless to say, I read it often!) You continue to lead and influence with your “A Year of Living Kindly” posts and books. Thank you! I’m so glad to hear that, Jan! You’re such a bright presence–I’ll wager you have an awful lot of notes and quotes like that. All well-deserved. Thanks for your kind words! Thank you for coming back and leaving a comment. You absolutely embodied the notion of choosing to extend a kindness when not doing so would have been easier and never missed. So glad you like that quote, too! Love this! We have no idea of the ripples we put into place with just the smallest effort. Thank you for following my blog. Thanks for your kind and wise comment. I’m looking forward to getting to know you through your lovely blog. And thanks to Dan at https://nofacilities.com/ for the introduction!